Disclaimer: Grab yourself a cup of tea and get cosy, this is going to be a long one. 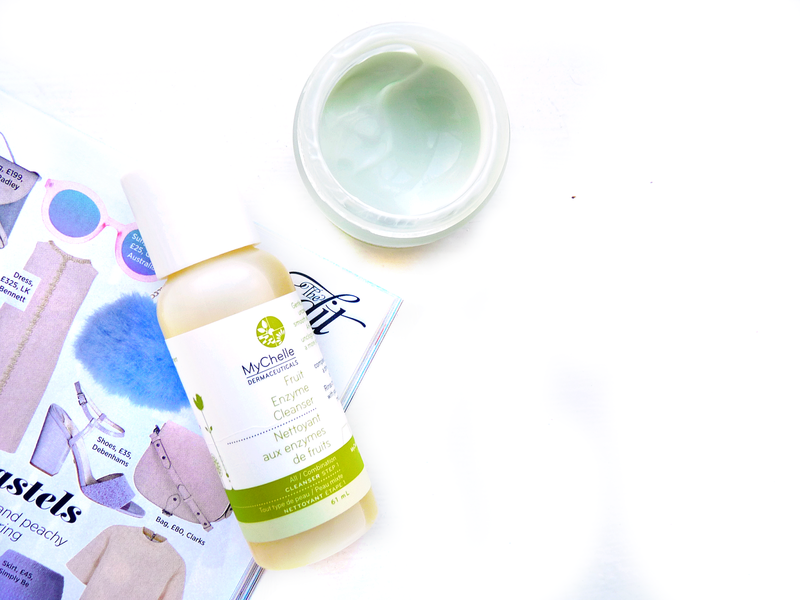 I've got so much to say about my experience with MyChelle, I couldn't tweak this post down much more! If you're skin is in serious need of rescuing, it's definitely worth the read. It's no secret that I've been struggling with my skin. Like, majorly, for the past twelve months. The main issue for me has been hard, red, bumpy spots on my cheeks, which in between April 2014 to September 2014 didn't shrink or change in any way shape or form. In October 2014 the spots on my cheeks disappeared for the first time in months. Don't get me wrong, I still had other blemishes, but the ones that hadn't gone in so long had finally budged, which was a big deal for me. I personally think the introduction of my Magnitone cleansing brush and my switch over to an all natural skincare routine was the trigger for ridding my skin of those stubborn spots, but by the end of October, they were back with vengeance (as beautiful and red as ever) and still were until a few weeks ago. Because of my skin issues, I don't change my skincare routine a lot. I like to keep it simple and consistent as to not cause any further eruptions on my super sensitive skin. When I introduce new products into my routine, I am really picky; I won't use anything with certain ingredients in it, anything entitled 'foaming' and you wouldn't catch me dead using a make-up wipe (read why here), so it's always nice to come across a new product range that tick all my boxes. MyChelle are the perfect example of a high quality all natural skincare brand, and honestly, I love everything their brand believes in and the products they create. Each and every one of their products are natural meaning a big thumbs up from me as you won't be finding any nasty ingredients in their skincare items, and in addition they are a vegan friendly brand as well as proudly eco-friendly. Very impressive if you ask me! Aside from their lovely brand ethics and practices, let's not forget the most important thing when it comes down to it; the products. I introduced two (was feelin' adventurous weren't I?) MyChelle products into my skincare routine probably about three weeks ago now, their Pumpkin Renew Cream and Fruit Enzyme Cleanser. When I first started using these products, I instantly fell in love with the Pumpkin Renew Cream. The majority of the time I like to have a different moisturiser for both day and night as I like my day cream to be lightweight and my night cream heavy duty, but I've found this perfect for both day and night use; although it's insanely nourishing it's lightweight once absorbed. The dominant oil in this moisturiser is pumpkin seed oil, which is known for being deeply moisturising and soothing, full of antioxidants and actually beneficial for battling acne. After only a week's use I felt like pumpkin seed oil was definitely living up to its reputation; my skin has been super soft, a lot less oily and dull, especially when I wake up of a morning my skin looks calm and balanced rather than the red, oily state that I would wake up in previously. But, most noticeably of all, my spots have been disappearing. I'm pretty certain both Fruit Enzyme Cleanser and the Pumpkin Renewal Cream have both played a significant part in this transformation, so I'll talk a bit about the Fruit Enzyme Cleanser before I go into more detail about the rescued state of my skin. Honestly, it took me a little bit longer to love the cleanser than it did the moisturiser. There was nothing wrong with the cleanser; I love the smell, texture, but when you use it there's not as much of that familiar 'squeaky clean' feeling I'd normally expect, which made me presume that this wasn't going to be efficient on my skin at all. Boy, was I wrong. Anyway, I decided to be patient with this as I knew it has turmeric in it which is meant to be great for calming sensitive and inflamed skin. After a few weeks of using every day and every night alongside the Pumpkin Renewal Cream I noticed a change. The spots on my cheeks, the ones that hadn't gone in almost a full year, started to disappear. I literally was (and still am) so surprised as I've tried so many different products over the past 10 months and nothing has caused any change to my cheek blemishes whatsoever. I didn't want to get ahead of myself as I could barely believe that it was happening, so I didn't get too excited in case it went back to normal a week later, but it was all confirmed to me when I actually got a compliment from a friend about my skin looking clearer. My cheek blemishes are still at bay, which honestly, makes me feel so much better in my own skin. Don't get me wrong, I still have bad skin. I still have spots, but the difference is spots have been coming and then going; they've never got to the going stage before now, they've always just stayed. But after almost of year of non-moving blemishes I am just so relieved and impressed to see some sort of change after just three weeks of using these products. Apologies for the ultra long post but I had to share my experience with these products from start to finish as they've made such a difference to my skin. 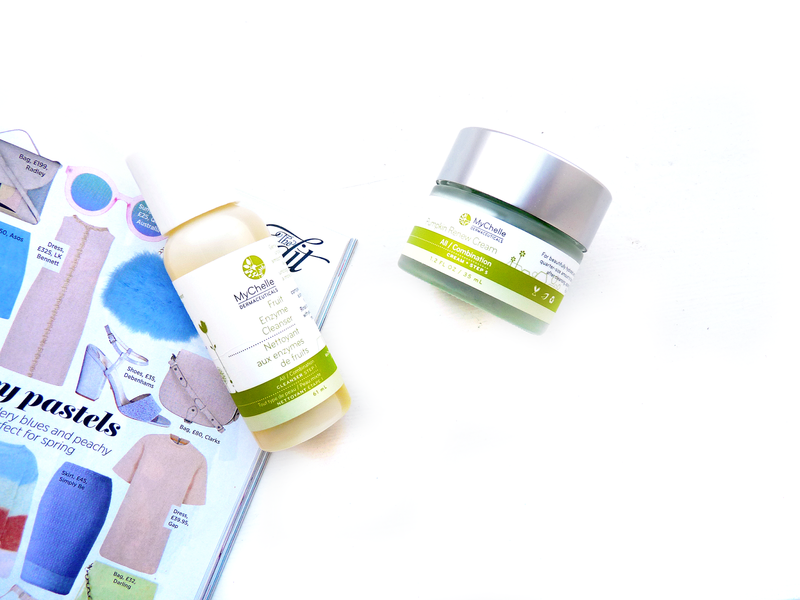 As well as the improvements to my blemishes my skin overall is less red, brighter and more balanced so I'd not only recommend these products to someone suffering with stubborn acne like as myself, but also those just wanting an all round skin rescue. Wow, sounds like this line really was a life saver for you. It's always great when you find products that actually work for your skin!